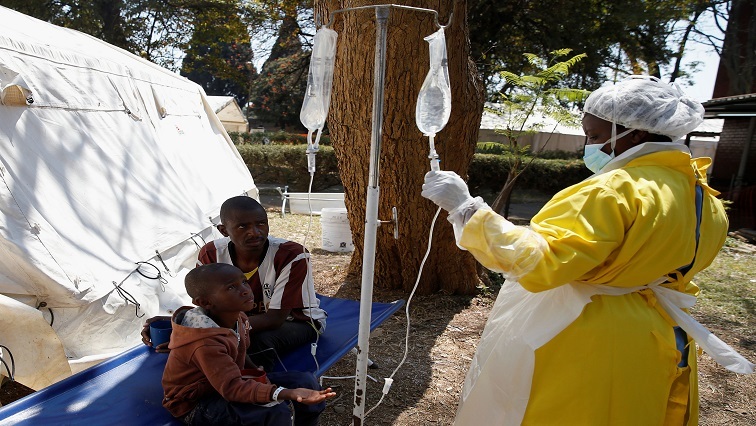 Zimbabwe police ban public gatherings in capital to contain cholera outbreak - SABC News - Breaking news, special reports, world, business, sport coverage of all South African current events. Africa's news leader. Patients await treatment at a makeshift cholera clinic in Harare, Zimbabwe, September 11, 2018. Zimbabwe’s police on Wednesday issued a ban on all public gatherings to control the spread of cholera, which has killed 21 people in the capital Harare, a day after the government declared an emergency following the outbreak of the disease. This entry was posted on 12 Sep 2018,04:45PM at 4:45 PM and is filed under Africa. You can follow any responses to this entry through the RSS 2.0 feed. Both comments and pings are currently closed.